The UBA DX CW contest is a very nice contest. Such a DX contest gives the opportunity to work everyone. On Saturday I used the lowest possible power in each QSO. On Sunday I also gave CQ my self in a few QSO's. I worked mainly station from Europe. The antenna is an Inverted Vee. The table shows the worked DXCC's. The numbers in red are more than 1000 MPW QSO's. After a quick count I realized, that I made much more 1000 Miles per Watts QSO's, than I expected. I really took it very easy in this contest. I used to have great fun with QRP, but this year I spent limited time in the contest. I worked 9 different states in 12 QSO in CW with QRP. When I started as a HAM, 20 years ago, I used my homebrew transceiver HM7, from Solid State Design, page 214...218, with an Inverted Vee, to work many different DXCC countries in Europe in CW. Because my power was only 500 mW, I had to look for stations, that I received with 599 or more, so the other station could hear my signal. During daylight hours my RST would be 559, or even lower. Please notice that a power of 500 mW is only four S-points weaker than 100 Watts. See the PA1B QRPp page. Soon I discovered, that when darkness fell, the signals from the south of Europe would be very loud. So this made it easy, to make QSO's over a distance of 1000 km or more. At that time, I did not realize, that my own QRPp signal, could also be an earsplitting 599, until I got genuine report from Italy, that my signal was S9, while using just 500 mW. During daylight hours, the signals are attenuated by the D-layer, which is absorbing. When the D-layer disappears during the night, the signal can reach the the E-layer without attenuation in the D-layer. The only attenuation of this sky wave, is (only) 6 dB for a doubling of the distance. So the signal will be very strong. I was wondering, what the lowest possible power would be, if I would reduce my power in that situation with this extreme propagation. If I reduced my power, so my RST would be 559, the difference is 4 S-point. This is a reduction in power of 4 x 6 dB = 24 dB But also 4x4x4x4 = 256. So I could reduce the the power from 500 mW to about 2 milliwatts. I was surprised by the low value, that I calculated, but this value is very realistic. I discovered that the frequency must be absolutely clear, when you use very low power. I very much like the ARRL international DX contest. In this contest, the DX stations like myself, will give their power in the exchange. This is great for a QRP station, because my power is directly visible to the other station. In my first ARRL international DX contest, I used 5 watts. My exchange 599 005 gave no problem for the receiving station. It was obvious, that I was using QRP. As a milliwatt and low power enthusiast, I often use the Lowest Possible Power, in each QSO. When I hear a station calling CQ, I look on the S-meter to determine the power with which I will answer. The higher the S-meter reading, the lower my power can be. When using the lowest possible power, I do not call CQ myself. In later years, I reduced to 500 mW. The use of 500 mW in a QSO was no problem, because I will often get an immediately correct response, but the problem was my exchange. How to indicated, that I was using only 500 mW. Over the years, I found out, that when I was using 500 mW, I best could use the exchange 599 001. The value 001 is the lowest value, that can placed in a Cabrillo file. But don't think that all problems are gone with 599 001. Some stations keep asking pwr?, because they think thay 001 is a number or they respond with 100? or even 1kW?. In that case I will respond with "599 1W 1W". * I met operators, that fall out of their chair, when they realized, that my exchange 599 001 indicated, that I was using only 1 watt. Please notice that when you use low power, that any QSO between Canada or the USA with Europe with 3 Watts or less, is good for 1000 Miles per Watt. Sinds eind december ben ik niet meer actief geweest in contesten. Ik had eigelijk niet zo'n zin in de PACC en het was maar de vraag of ik wel tijd zou hebben vanwege andere bezigheden. Toen de PACC gestart was, wandelde ik nog heerlijk in Amelisweerd. Ik was daar al in maanden niet meer geweest en het lekker weer was, om te wandelen. Om 12:33 utc logde ik dit reigertje. Since the end of december I have not been active in contests. On Saturday I mainly replied stations calling CQ. On Sunday morning, in the last hour of the contest I made 37 QSOs while giving CQ. That is all the more QSOs on Saturday. The total number of QSO's is 64. Yesterday I received the schematic of a very remarkable transceiver in an e-mail from Peter DL3PB. 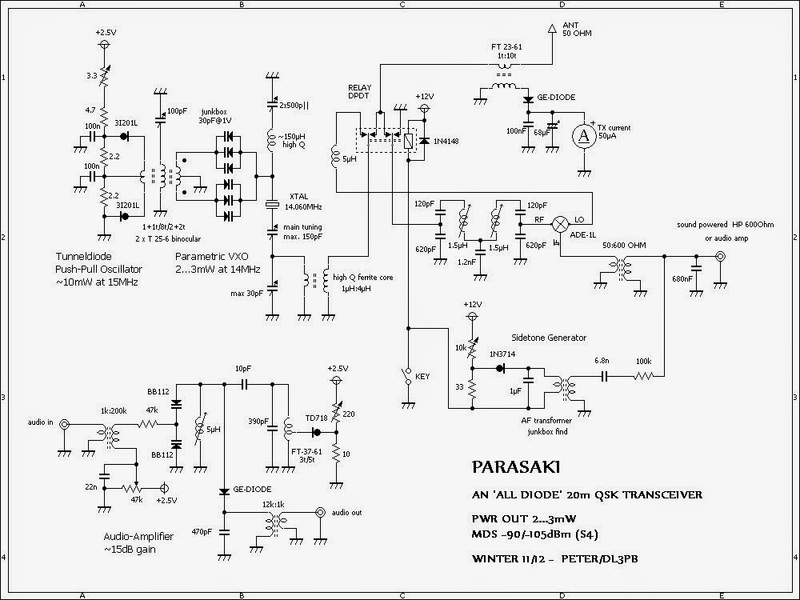 The Parasaki transceiver is an all diode receiver which is built with tunnel diodes in stead of the usual transistors. Peter proudly said, that a long cherished dream came true, after 40 years, to build and operate a transceiver build with tunnel diodes. Christophe F8DZY replied to my very first call on 20m band in REF-contest last weekend. I was running 2mW into a temporary vertical dipole on my balcony. Distance between us is 918km - obviously OM Christophe has excellent ears. The low impedance of the high peak-current tunneldiodes make it very difficult to built a really crystal controlled oscillator rather than an LC-oscillator, synchronized by the crystal more or less, at least on the higher SW-bands. The Parametric VXO provides a crystal-stable, chirp-free signal on expense of an output power of two milliwatts only instead of ten, but with an amazing spectral purity, no need for a low pass filter or such. Of course it sounds pretty cool making a QSO with a 'bunch of diodes' and a parametrically excited crystal, but believe me or not, I'd preferred to bring that full ten milliwatt into the air - on the other hand that approach allowed to tune the rig a bit ( ~ 5kHz/per xtal ), which turned out to be much more valuable than a few milliwatts more while being 'rock-bound'. The receiver in its 'gain-less' version works fine for strong signals - while listening to QRP(p) stations, the moderate gain of the audio amplifier helps a lot. A comfortable frequency shift between receive and transmit is realized by the 5µH inductor at the LO-port of the mixer, with little effect on sensitivity. As a milliwatt enthusiast my self, I know the thrill of making contest QSO's with a few milliwatts. Your 2 mW reminds me of the QSO's, I made in 2001 to 2003 with 2.5 mW to 10 milliwatts in many different contests. Yes, Christophe must have excellent ears. But with so little amplification in your receiver, you also must have excellent ears. I heard F8DZY call CQ test - he was really booming in, and I recalled your strategy, to monitor the signal strength of the incoming signal in order to find the best time for a call. I have no S-meter, but he was peaking such, that I was sure that couldn't last for long - so decided I'd better give him a call immediately rather than trying to squeeze the last tenth of milliwatt out of my rig - so I did and before I could repeat my call once more, he came back with my callsign and the department number - so it payed off to study your miliwatting results carefully! Sensitivity of the receiver is not that bad, given the low part count - with the audio amp and a sound powered' headphone I can copy EU-QRP stations pretty good. Of course that won't work with a TV playing in the background, but I'm blessed with a wife, who is willing to use headphones on occasion. Thanks a lot, Bert, please keep up your great blog! Congrats Peter, on your great achievement! more info on the Parasaki transceiver.